We have been carrying the TFT Hydrant Wrench for a few weeks now and have found it to be a good wrench that is easy to use and surprisingly light in weight. Using the large "claw" it tightens up the steamer connection handily without slipping. The square nut wrench on the other end also serves as good lever to tighten or loosen rabbit-ear couplings. 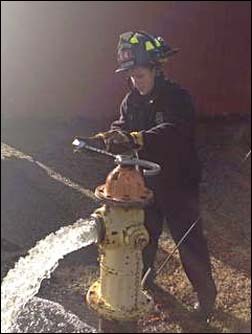 Technician Davis liked the extra leverage while turning on a sticky hydrant valve by taking advantage of the nut head being in the center of the wrench allowing the use of two hands on each side. It seemed to make it easier to turn on the valve. Using the large spanner on supply line couplings to the pump panel worked fine, but using the smaller lug wrench on discharges is too cumbersome to bother with. It would be ok in a pinch or to use when breaking down a line later, but the standard spanners are better suited for that. But it is primarily a hydrant wrench and it is a very good tool for that. The specially-formed grip along the shaft is a bonus, making it a little safer and easier to use. Lieutenant Cunningham shows the relative sizes of the TFT wrench compared to the standard hydrant wrench. The TFT wrench is made of an aluminum alloy and its 2-½ lb. weight surprises you the first time you pick one up. The "old" hydrant wrenches weigh about 5 lbs. Overall, we really like using the new wrench and from our experience so far would recommend it. Stafford County Fire & Rescue. To pick up a TFT Hydrant Wrench & Multi-Tool of your own, click here!